Thursday, Nov. 1, at the Harriet Beecher Stowe Center, 77 Forest Street, Hartford; 5:00 p.m. reception, 5:30 pm discussion. FREE event! To register, call 860-522-9258, Ext. 317. Nook Farm Book Talk, a collaboration between The Mark Twain House & Museum and the Harriet Beecher Stowe Center, continues with Poganuc People, Harriet Beecher Stowe's loosely based autobiographical work. Stowe depicts the life and times of a small Puritan town, Poganuc, based on her childhood in Litchfield, Connecticut. It features colorful characters like Miss Dolly and Colonel Davenport, local politics, small town religiosity, and anecdotal recipes for life. Friday, November 2, 7:00 p.m. reception, 8:00 p.m. conversation. Tickets are $25, and can be obtained by calling 860-280-3130 or 860-232-0050. A conversation with six authors, "Come Out Writing: Queer Authors Tell All," will take place at The Mark Twain House & Museum on Friday, Nov. 2, and explore the particular problems and strengths that the fact of being gay brings to the writer's art. All proceeds from the event benefit the museum and True Colors, the Hartford-based non-profit organization that provides support, education and advocacy for lesbian, gay, bisexual and transgender youth, adults and families. Participants include novelist, actor and filmmaker James Lecesne; poet and journalist Bessy Reyna; playwright Jacques Lamarre; author Frank Anthony Polito; writer Tanisha McMillan; and novelist Jennifer Lavoie. Deadline is Monday, Nov. 5, for six-week classes starting next week. Tuition is $500. Call 860-280-3130 to register. Susan Campbell on Non-Fiction, Mary-Ann Tirone Smith on Fiction: We're extending the deadline for registering for our popular six-week fall writing classes: The new deadline is Monday, November 5. Fundamentalism, Feminism and the American Girl; Smith is the similarly acclaimed author of Masters of Illusion and Girls of Tender Age. The six sessions of each class will run at the same time in separate classrooms -- from 5:30 to 7:30 p.m. on Wednesday evenings in the Mark Twain House Museum Center, beginning Nov. 7 and running to December 19 (no class Nov. 21). Casting has been announced for Westport Country Playhouse’s Script in Hand playreading of “Over the River and Through the Woods” by Tony Award-winning playwright Joe DiPietro, a comedy about a single, Italian-American guy who visits his beloved, though annoying, grandparents every Sunday for dinner. Scheduled for one-night-only on Monday, Nov. 12 at 7 pm, the cast includes Matthew Amendt, Nicole Lowrance, David Marguiles, Frances Sternhagen, Maria Tucci, and Lenny Wolpe. Director is Anne Keefe, Playhouse artistic advisor. Tickets to the Script in Hand playreading are $15. 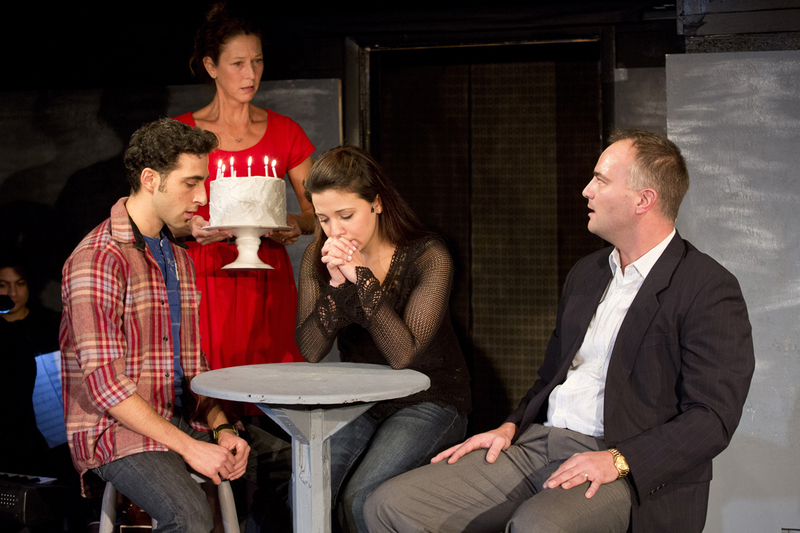 Tickets for the reading and post-performance dessert reception with the cast in the Playhouse’s Sheffer Studio are $50 ($15 for reading plus a $35 donation for reception). The reception will include Italian desserts and Prosecco. 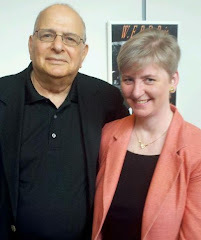 Playwright Joe DiPietro won two Tony Awards for co-writing “Memphis,” which also received the 2010 Tony, Drama Desk and Outer Critics Circle awards for Best Musical. He wrote the book of the current Broadway musical, “Nice Work If You Can Get It.” His other plays and musicals include “I Love You, You're Perfect, Now Change” (the longest-running musical revue in Off-Broadway history); “The Toxic Avenger” and “The Thing About Men” (both winners of the Outer Critics Circle Award for Best Off-Broadway musical); the much-produced comedy “Over the River and Through the Woods”; “The Art of Murder” (Edgar Award winner for Best Mystery Play); and the Broadway musical “All Shook Up.” His drama “Creating Claire” debuted at George Street Playhouse in 2010. His work has received thousands of productions across the country and around the world. Director Anne Keefe served as artistic director of Westport Country Playhouse, with Joanne Woodward, in 2008 and as associate artistic director from 2000-2006, also with Ms. Woodward. She co-directed with Ms. Woodward the Westport Country Playhouse production of “David Copperfield,” and directed many Script in Hand playreadings. Upcoming Script in Hand playreadings include the romantic comedy, “The Philadelphia Story” by Philip Barry, on Monday, December 10, 7 p.m. “The Philadelphia Story” has been a play, a film, and, as “High Society” with music and lyrics by Cole Porter, a Broadway and movie musical as well. Other Script in Hand playreadings will take place on Mondays, February 11 and March 11, titles to be announced. For more information or tickets, call the box office at (203) 227-4177, or toll-free at 1-888-927-7529, or visit Westport Country Playhouse, 25 Powers Court, off Route 1, Westport. Tickets are available online 24/7 at www.westportplayhouse.org. Stay connected to the Playhouse on Facebook (Westport Country Playhouse), follow on Twitter (@WCPlayhouse), view Playhouse videos on YouTube (WestportPlayhouse) or get an insider’s peek on The Playhouse Blog (www.theplayhouseblog.org). As of 2 pm, Metro-North will restore limited service on its Harlem Line between North White Plains and Grand Central Terminal. The service will operate every hour. Hudson and New Haven Line continue to be suspended. See www.mta.info for full details. Off-peak fares will be in effect. Customers should hold onto their October monthly and weekly tickets; they will be valid for travel through Monday, Nov. 5. I wasn't able to reschedule a performance of The Last Romance at Seven Angels Theatre following an injury that haulted the opening night performance at intermission, but colleague Bonnie Goldberg has forwarded a link to her review which you can read at http://bonniegoldberg.blogspot.com. Thanks Bonnie! The show runs through Nov. 11. For tickets and information: 203-757-4676 or online at www.sevenangelstheatre.org. Performances are Thursday at 2 pm, and 8 pm., Friday at 8 pm, Saturday at 2 pm and 8 pm and Sunday at 2 pm. 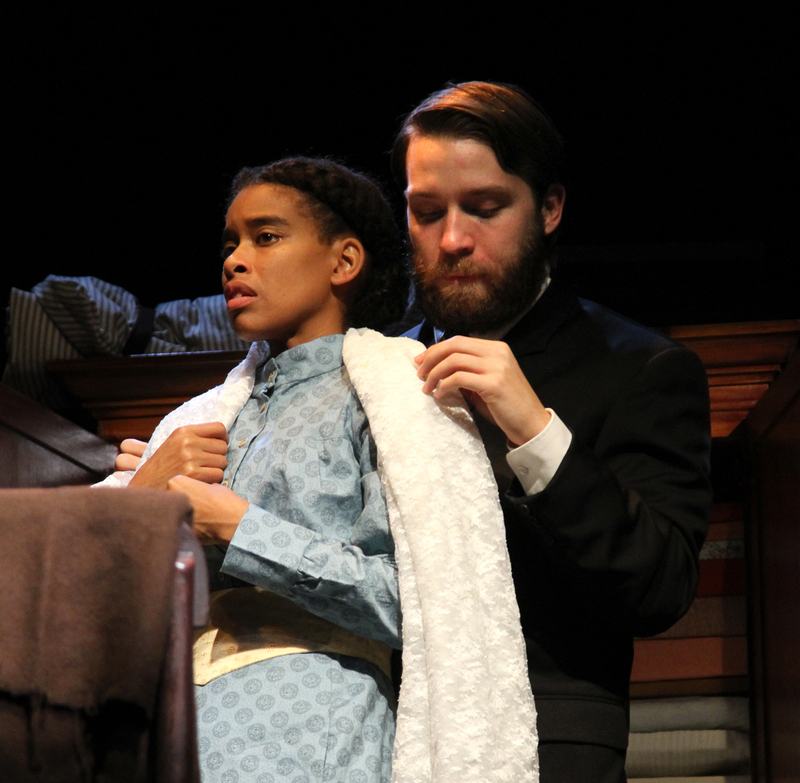 Esther Mills (Khetanya Henderson) with Mr. Marks (Harrison Howard Haney) in a scene from Connecticut Repertory Theatre’s production of Intimate Apparel, by Lynn Nottage, playing now through Nov. 4 in the Studio Theatre, Storrs. For tickets and information, call 860-486-2113 and visit www.crt.uconn.edu. Photo by Gerry Goodstein. CT Rep's preformance of Lynn Nottage's Intimate Apparrel is on for tonight in the studio at 7:30 pm. Info: 860-486-2113 or http://crt.uconn.edu/. Check here for the latest regarding cancellations, schedules due to the Hurricane Sandy storm. IVORYTON PLAYHOUSE has cancelled the first two preview performances of THE KITCHEN WITCHES on Wednesday, Oct. 31. One preview performance on Thursday Nov. 1 still possible before opening on Friday, Nov. 2. Check back for update. YALE REP cancels Monday’s Preview Performance of Marie Antoinette. If you have tickets for Monday night, they will be honored for an alternate performance. Tickets exchanged without fees when the box office reopens on Tuesday or Wednesday. --- METRO NORTH trains, NYC subway service and LIRR service will be shut down as of 7 p.m. Sunday. Additionally, final bus service end at 9 p.m.
Esther Mills (Khetanya Henderson) with Mr. Marks (Harrison Howard Haney) in a scene from Connecticut Repertory Theatre’s production of Intimate Apparel, by Lynn Nottage, playing now through Nov. 4 in the Studio Theatre, Storrs. Photo by Gerry Goodstein. Connecticut Repertory Theatre will present Intimate Apparel Oct. 25 – Nov. 4, as the first show in its Studio Works Series in the Studio Theatre on the Storrs campus. For tickets and information, call 860-486-2113 or visit www.crt.uconn.edu. At 35, Esther is lonely. A skilled African-American seamstress in 1905 Manhattan, she makes exquisite undergarments for clients. Strong, practical and confident Esther resists her landlady’s insistence on marriage for marriage’s sake while cautiously allowing an unexpected friendship, filled with longing, to grow between her and her fabric merchant, an immigrant Jew. After exchanging letters with a West Indian laborer, Esther finally accepts his invitation and marries this man she has never met. Pulitzer Prize-winning playwright Lynn Nottage stitches a tale of romance, greed and ambition – and also a tender story of seeking real friendship across the vast social gulf separating a seamstress and a socialite, the yearning of inter-racial as well as inter-faith love, and the persistence of spirit as Esther tries to craft a life as beautiful as one of her camisoles. Intimate Apparel offers both a historical exploration into the black experience in America in the beginning of the 20th century, as well as a personal exploration into how societal constructs directly affect an individual’s opportunities and choices. Intimate Apparel won the 2004 New York Drama Critics’ Circle Award for Best Play, the American Theatre Critics/Steinberg New Play Award and the Outer Critics Circle Best Play Award. Nottage has received a MacArthur “Genius” Grant (2007), two NAACP Theatre Awards for performance and the PEN/Laura Pels International Foundation for Theater Award for a playwright in mid-career (2004). Nottage won the OBIE Award for Fabulation, or the Re-Education of Undine and the Pulitzer Prize for Drama for Ruined in 2009. 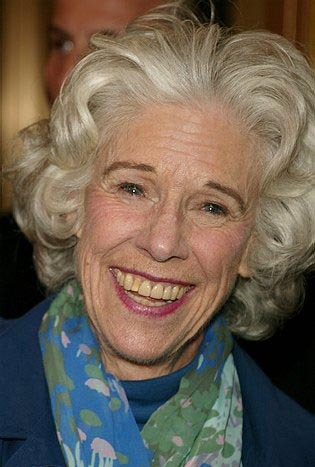 In 2010, she received the Distinguished Playwright Award. For tickets and information, call 860-486-2113 and visit www.crt.uconn.edu. The theme for Hartford Stage's 2012/13 season, "All the World," is being represented in the "map dress" made entirely out of paper, on display in the theater lobby. Hartford Stage costume department's Susan Aziz and Barry Sellers collaborated on the map dress made entirely out of paper. Barry arrived at the idea after purchasing an oversized book of antique maps. Inspired by the colors and images, he brought the idea of a paper map dress to Costume Shop Manager Matt Smart. Barry made a pattern for a practice dress out of white butcher paper and used various paper punches to simulate lace and detailed trim. He then teamed up with Susan to print map images from a large scale printer used for blueprints and then use those print-outs as "fabric" for a dress. Susan had the idea to wad up all the paper maps then smooth them out before sewing them together, which gave texture to the dress. 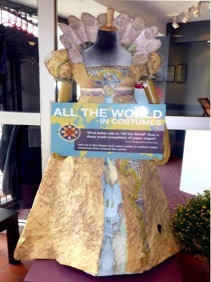 The paper map dress is on display in the Harford Stage lobby through December 2012. 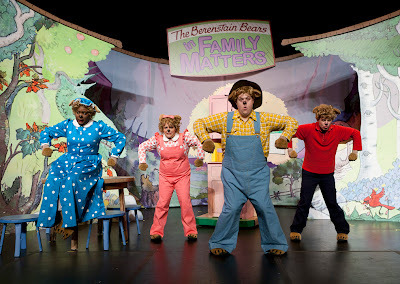 “The Berenstain Bears LIVE in Family Matters, The Musical” will launch the 2012-13 Family Festivities Series at Westport Country Playhouse on Sunday, Nov. 11 at 1 and 4 pm. Tickets are $18. The new musical is an adaptation of three of The Berenstain Bears’ most beloved books: “The Berenstain Bears Learn about Strangers,” “The Berenstain Bears and Too Much Junk Food,” and “The Berenstain Bears’ Trouble at School.” Using the iconic stories and imagery of the original books, “The Berenstain Bears LIVE in Family Matters” stresses the importance of honesty, health, safety, and family. Adapted from the popular works by Stan and Jan Berenstain, and produced by Matt Murphy Productions, the presentation is recommended for ages 4 and up. One hour before each performance, Westport’s Wakeman Town Farm will host a pre-show activity focused on healthy food. In conjunction with the Family Festivities Series, the Playhouse is hosting a book collection for Read to Grow, Inc., a statewide nonprofit organization that helps parents take an active role in their children's literacy development by providing free children's books to families with limited access and to community resources that serve them. At each Family Festivities performance, bins will be located in the Playhouse lobby for donations of gently used and new children’s books which will be given to families and programs in the greater Fairfield County area through Read to Grow. The Family Festivities Series will continue with “Angelina Ballerina, The Musical,” on Sunday, Dec. 9, featuring a feisty little mouse with big dreams of becoming a prima ballerina. “Fancy Nancy, The Musical,” on Sunday, Jan. 27, finds Fancy Nancy and her friends auditioning for their very first show, “Deep Sea Dances”; “Junie B. Jones,” on Sunday, Feb. 10, stars outspoken, precocious, lovable Junie B. Jones in a new musical about new friends, new glasses, sugar cookies, and the annual kickball tournament; “How I Became a Pirate,” on Sunday, March 3, is a musical adventure about young Jeremy Jacob, who is recruited by Captain Braid Beard and his mates to join the pirate crew on a quest to bury their treasure; and “The Little Engine That Could™ Earns Her Whistle,” on Sunday, April 7, a new musical that portrays Watty Piper’s timeless tale about hard work, self-confidence, friendship, and believing that anything is possible. Everyone in the audience requires a ticket. For more information or tickets, call 203-227-4177, 1-888-927-7529, visit Westport Country Playhouse, 25 Powers Court, off Route 1, Westport; www.westportplayhouse.org. Hartford Stage has announced the winners of the Annual Young Playwrights' Competition, Write On, for students in grades 9-12, and this year's winners are Abigail Kehoe, Alyssa Slotnick, Christopher Snow, Joe Buchek and Jonas Shivers. Abby Kehoe is a senior at Classical Magnet School in Hartford, where she is taking a playwriting class and slowly warming to this dialogue-heavy literary medium. 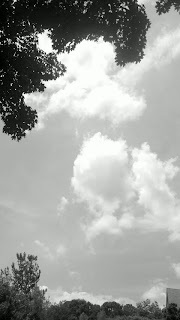 Flash fiction, poetry, and novels are her usual forte, but she is hopeful that this opportunity will expand her writing repertoire and make her a better-rounded thespian. Abby is currently stage-managing Classical's production of Iphigenia 2.0 and preparing for National Novel Writing Month in November, where she will be attempting her first complete novel. Alyssa Slotnick is a senior at Lewis Mills High School in Burlington, CT. She has a love of both reading and writing, as well as an interest in photography. She is currently taking AP English at her high school as well as several other English classes. Throughout high school she has had an interest in writing short fiction, and though playwriting is a new genre for her, she is very excited to use Write On to its full potential in exploring and learning a new type of writing. Christopher Snow was born in Hartford, CT, and has always been interested in art, film, media direction and production, acting, fashion, and interior design. He had the good idea of doing Write On because he sees it as good start in the art industry, starting with playwriting. Joe Buchek is a junior at Hall High School. He has never written a play before this one and hopes to learn from this workshop. Jonas Shivers is a senior at Hall High School in West Hartford. Jonas has a large background in technical theater working on a lot shows throughout his four years at Hall, including but not limited to, Moon over Buffalo, Romeo & Juliet, House of Blue Leaves, Our Town, The Children's Hour, Cheaper by the Dozen, and Under a Better Sky. He likes to write short stories. Jonas also is an actor, musician, DJ, and a freestyle skier in the winter. Students were asked to submit an idea inspired by a topic that is important to them and relevant in their world and for these selected playwrights, Hartford Stage's Education Department will help with the rest. Winning playwrights sit in on rehearsals for Hartford Stage's Brand:NEW Fall Festival of New Works, participate in writing workshops lead by Hartford Stage's Aetna New Voices Fellow, and see their own plays performed for the public by professional actors and directors. This year, the writers in the Write On program will work with Aetna New Voices Fellow, Matthew Lopez (The Whipping Man). Joyce Jeffrey will play the role of Carol in The Last Romance at Seven Angels Theatre, Waterbury, this week. She replaces Marie Wallace who was injured in a fall from the stage during Saturday night's opening. Wallace fell off the the stage right front part of the stage during a blackout at the end of act one. The second act and Sunday's matinee performances were cancelled. Ticketholders to those shows can exchange for other performances running through Nov. 11. Call the box office at 203-757-4676. Wallace is doing well, Seven Angels' PR and Marketing Director, reports. Offering its first musical premiere since the 1996-97 season, Hartford Stage presents a tongue-in-cheek, Edwardian romp among the royals in A Gentleman’s Guide to Love & Murder starring Tony-Award-Winner and Connecticut native Jefferson Mays (I Am My Own Wife) as eight different characters. The story appears to be an adaptation of the movie “Kind Hearts & Coronets” by Robert Hamer and the 1907 novel “Israel Rank: The Autobiography of a Criminal by Roy Horniman” on which that was based. Neither of these works are credited in the program. Tresnjak does write notes there, however, about some of the process of development (some eight years) for Freedman, who also wrote lyrics, and collaborator, composer Steven Lutvak. Plot points and other details are changed (in the movie, it’s a Dukedom and the name is Chalfont) and the ways the family members meet their maker are different, so it’s not exactly the same, but star Alec Guinness plays the multiple roles there too in what is pretty much the same story. The musical, receiving its world premiere at Hartford Stage, was developed in part at the 2006 Sundance Institute Theatre Lab and is presented in association with the Old Globe Theatre in San Diego which will present the show next spring. Meanwhile, complicating Monty’s plans to take his royal seat are romances with his feeling torn between adulterous lust for the beautiful Sibella (Lisa O’Hare), who spurned him to marry a wealthy rival, and his cousin Phoebe (Chilina Kennedy, who delights with a beautiful operatic soprano). 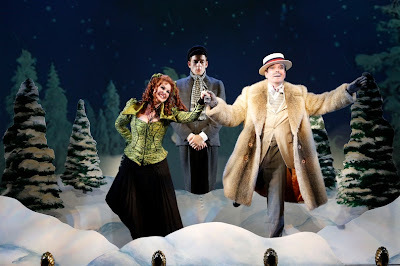 All of the action takes place on an ornate proscenium stage designed by Alexander Dodge to accommodate among other things, a beautiful garden where bees attack and a winter wonderland pond where ice-skating turns deadly (and where corny choreography by Peggy Hickey makes a smile – and the ice -- crack). Linda Cho designs costumes that aren’t quite true to the period, but which accommodate the choreography. Ayers shines as Lady Eugenia, the other half of a marriage-from-hell pairing with Mays as well. The cast, musically directed by Paul Staroba, who conducts a six-member man in a pit beneath the stage (made possible by last season’s renovations), is strong vocally – though Barnett struggles at the very high end of his register. Nice orchestrations are provided by Jonathan Tunick, but Lutvak’s repetitive sounding music is not memorable and many of the individual tunes continue way too long. The show’s more-than-two-and-a-half-hour run time could be tightened considerably with some needed trimming and elimination. Prime candidates for the cutting block are the opening number titled “A Warning to the Audience” which seemed more like a place holder for “insert opening number here” than as a set up for the show, and the second-act opener “Why Are All the D’Ysquiths Dying?,” an unnecessary recapitulation of everything that has happened so far. Lutvak and Freedman’s many-syllabled, exposition-filled lyrics are far more complicated than the plot. Trust me. Tresjnak brings the actors out into the house a couple of times via a horse-shoe extension around the back of those seated on floor level in front of the stage. It’s a nice touch and he adds some comedic panache to staging a scene where a trapped Monty keeps both love interests from seeing each other with opposite doors. It’s fun theater, if not exactly new. And seeing a musical at Hartford Stage is almost as likely as eight members in the line to the earldom kicking off, so enjoy it while you can through Nov. 11 at Hartford Stage, 50 Church St., Hartford. Matinee performances are Sundays and selected Wednesdays and Saturdays at 2 pm. Evening performances are Tuesday, Wednesday, Thursday and Sunday at 7:30 pm; Friday and Saturday at 8 pm; Stay/Play Performance at 6:30 pm Oct. 31. Tickets range $26.50-$93.50 (860) 527-5151; www.hartfordstage.org. Casting is set for readings at the Brand:NEW Fall Festival of New Works Oct. 25 - 28 at Hartford Stage. The Festival will include readings of five new plays by Octavio Solis, Bess Wohl, Dan O'Brien, Matthew Lopez andJanine Nabers, as well as a playwrights' panel Oct. 28 at 4:30 pm. Se Llama Cristina, by Octavio Solis and directed by Loretta Greco, will feature William Zielinski (The Lovely Bones, film), Nancy Rodriguez (The Tempest, Oregon Shakespeare Festival) and Felix Solis (Havana is Waiting, Cherry Lane Theatre). Oak Dale, by Dan O'Brien and directed by Elizabeth Williamson, will feature Michael Cullen (Cobb, Falcon Theatre). Reverberation, by Matthew Lopez and directed by Maxwell Williams, will feature Nick Westrate (the North American premiereof Tribes,) and Chris Perfetti (Sons of the Prophet, Roundabout Theatre Company). Brand:NEW readings will be at Hartford Stage's Rehearsal Studio 2 at 942 Main St., Hartford (the Residence Inn building). See all five readings for $25 ($20 for Hartford Stage subscribers) or individual readings for $10 each. Tickets are available by calling the Hartford Stage box office at 860-527-5151 or by visiting www.hartfordstage.org. The Little Sisters of Hoboken have gone Hollywood in the highly anticipated, latest installment of Dan Goggin’s international smash-hit Nunsense franchise, Nunset Boulevard: The Nunsense Hollywood Bowl Show, which will be presented at the Palace Theater in Waterbury on Thursday, Nov. 8, at 7:30 pm. The tour stars Cindy Williams (Shirley of “Laverne & Shirley” fame), who will reprise her role as “Mother Superior” from the Meadow Brook Theatre presentation of the original Nunsense. Tickets are $75 and $45 and can be purchased by phone at 203-346-2000, online atwww.palacetheaterct.org, or in person at the Box Office, 100 East Main St., Waterbury. Nunset Boulevard follows the latest exploits of The Little Sisters of Hoboken, who have been invited to perform at the Hollywood Bowl. They are thrilled at the prospect until they arrive and realize that they are booked into the Hollywood Bowl-A-Rama - a bowling alley with a cabaret lounge - and not the famed “Bowl” they imagined. Things do not go as planned until The Sisters catch wind of the fact that Movie Producer James Todd is across the street auditioning for roles in his new movie musical about the life of Dolores Hart, the famous movie star who became a nun. The Sisters, thinking they are naturals for parts, race off to audition during their show’s intermission. Could this be their big break? As part of a special fundraiser for the Abbey of Regina Laudis in Bethlehem, CT, where Sister Dolores Hart currently resides, a portion of ticket proceeds from the Palace’s presentation of Nunset Boulevard will benefit the Abbey’s New Horizons Fund. Before the show, Sister Dolores will meet and greet patrons in the orchestra lobby, and after the show, patrons who purchased a $75 ticket will be invited to attend a post-show reception meet-and-greet in the mezzanine lobby with star Cindy Williams, director Dan Goggin and other members of the cast. At 5:30 pm, Emily’s Catering Group will prepare a preshow dinner in the Palace’s Poli Club, located on the Mezzanine level of the theater. The dinner is $40 per member and $50 per non-member, which includes tax, service fees, coffee, and tea. A cash bar is also available. Seating is limited, and reservations can be made when purchasing tickets through the Box Office. Nunsense, the creation of Catholic-school-educated author/composer Dan Goggin, premiered in New York City at the Cherry Lane Theater in 1985, where it won four Outer Critics' Circle Awards, including “Best Off-Broadway Musical.” It then transferred to the Douglas Fairbanks Theater on 42nd Street, where it ran for over 10 years, and has been presented all over the world in over 8,000 productions, grossing more than $500,000,000. During its New York run,Nunsense became the second longest running musical in Off Broadway history, eclipsed only byThe Fantasticks. For more information, visit www.nunsense.com. The HSO will join with trumpeter Brain Lynch in a tribute to this 1971 album, considered to be a modern classic. Grab your “King of Swing” and “Go Daddy O” to see the HSO and guest artists Big Bad Voodoo Daddy take a New Orleans-style twist on the legendary big bands and swing orchestras as part of their Rattle Them Bones Tour. “Retro hep-cat cool.” – Rolling Stone. “The music picks up a beat and doesn’t let go.” – Everett Daily Herald. Thursday, January 10, 2013 │ 7:30 p.m.
Friday, January 11, 2013 │ 8:00 p.m.
Saturday, January 12, 2013 │ 8:00 p.m.
Sunday, January 13, 2013 │ 3:00 p.m.
Rachmaninoff’s Vocalise is one of the most romantic classical pieces ever written. Symphonie Fantastique changed the musical world and takes listeners to a place just as vivid, obsessive and passionate as it was in Berlioz’s day. Barber’s Violin Concerto is lyrically indulgent, from the composer who also wrote the beautiful Adagio for Strings. Join HSO and world-renowned violinist Alexander Kerr on this amorous musical adventure. -Tickets to Handel’s Messiah are $35 for general admission. Student tickets are available for $15. -Student tickets, available for Masterworks, Pops, and Jazz and Strings concerts, are $10. The Hartford Symphony Orchestra’s 2012-2013 season is sponsored by Saint Francis Hospital and Medical Center. The Hartford Symphony Orchestra receives major support from the Greater Hartford Arts Council, the Hartford Foundation for Public Giving, and the Connecticut Commission on Culture & Tourism. The 2012-2013 Masterworks Series is sponsored by MetLife Foundation and The Edward C. and Ann T. Roberts Foundation, with additional concert support from Cigna, Hartford Hospital, and the Katharine K. McLane and Henry R. McLane Charitable Trust. The HSO 2012-2013 POPS! Series is presented by United Technologies Corporation, with additional concert support from Hartford Hospital and Prudential Retirement. The 2012-2013 Sunday Serenades Series is sponsored in part by The Saunders Foundation Music Endowment at the Wadsworth Atheneum. 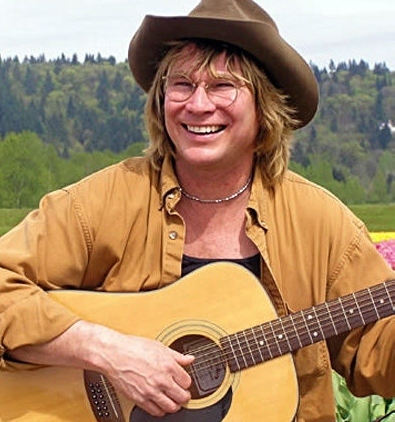 Tribute to John Denver featuring Ted Vigil with special guest Steve Weisberg, Denver’s lead guitar player, plays Bridgeport’s Downtown Cabaret Theatre for two performances only Saturday, Oct. 27 at 5:30 and 8 pm. The 75-minute show will be performed without an intermission at the Downtown Cabaret Theatre, 263 Golden Hill St., Bridgeport. Doors will open 30 minutes prior to each scheduled performance. All Reserved tickets are: $33: 203-576-1636; downtowncabaret.org; Box Office Hours: 11am to 4:30pm – Sundays thru Saturdays, open 90 minutes prior to scheduled performance times. Goodspeed has announced the lineup for its 50th anniversary season. Good News (Words and Music by B.G. DeSylva, Lew Brown and Ray Henderson) will run from April 12 – June 22; Jerry Herman’s Hello, Dolly! 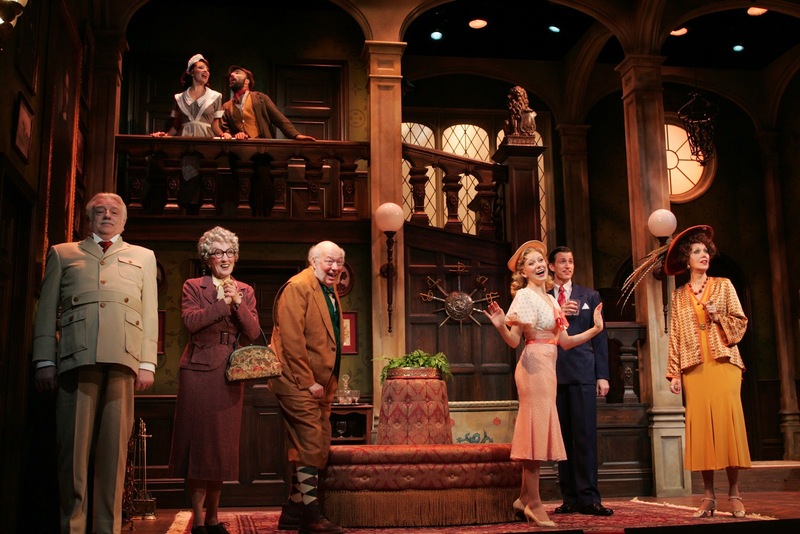 will run from June 28 – Sept.8; and Frank Loesser’s The Most Happy Fella will run from Sept. 20 – Dec. 1. on Broadway. Advance season subscriptions are now on sale (860-873-8668). Single tickets go on public sale beginning Feb. 17, 2013. Dance-theater artist Judy Dworin's new work “Meditations from a Garden Seat,” will have its premiere at Charter Oak Cultural Center, Nov. 1-3. It is intended to "challenge common perceptions of the incarcerated by depicting their questing spirit, permanent sorrows, and joyous transformations within the barren confines of prison." General admission is $25, $15 for seniors and GHAC Let’s Go! members, and $10 for students. For more information, visit www.charteroakcenter.org or call 860-249-1207. Caveman, a play by Richard Maxwell, directed by Roy Faudree will be presented in Garmany Hall at Trinity College’s Austin Arts Center, Thursday, Nov. 15 at 7:30 pm and Friday and Saturday, Nov. 16 and 17 at 4:30 and 8:30 pm. Running time is one hour, with no intermission. Admission is free; seating is limited, however, so reservations are strongly recommended. 860-297-2199. Due to illness, last Friday's Navaratri Festival concert, "B. Balasubrahmaniyan: Vocal Music of South India", was postponed until Friday, Nov. 2 at 8 pm in Crowell Concert Hall at Wesleyan University. The Box Office is contacting all ticket holders; tickets for the postponed concert will be honored at the rescheduled concert. FOCUS NEXT, is a juried show presented by TheaterWorks and Paper New England. 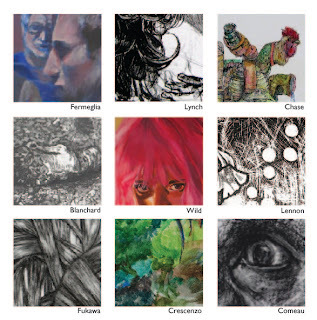 Faculty from the Hartford Art School, University of Hartford, Central Connecticut State University, Wesleyan University, Trinity College and the University of Connecticut were invited to submit the work of BFA / BA students who best represented the strength of their programs. 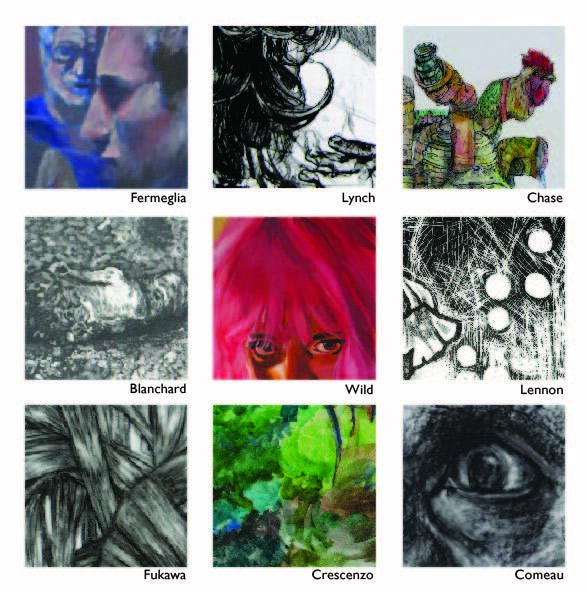 The artists included in FOCUS NEXT are either recent graduates or about to graduate: Hartford Art School - Sandy Chase, Akino Fukawa and Kaitlin Lennon; from Trinity College - Katherine Crescenzo,; from Wesleyan Uniiversity - Cordelia Blanchard; from UCONN - Katie Wild; Matthew Comeau and Taylor Lynch; and from CCSU - Alexa Fermeglia. Also on view throughout TheaterWorks first floor - large works by New Haven artist JD Richey. Now Through Nov. 11. Gallery Hours: Monday through Friday 9 - 3 pm. By appointment - and 90 minutes pre-show. Ron Crawford and Marie Wallace. Photo courtesy of Seven Angels Theatre. Actress Marie Wallace was injured in a fall from the stage at the Opening Night performance of The Last Romance, a play by Joe DiPietro, at Seven Angels Theatre last night. Today's matinee (Oct 21) has been cancelled. Ticket holders for both performances may exchange tickets for a different date. The first act of the comedy/romance had just finished when, in the blackout into intermission, Wallace fell off the front stage right portion of the stage. Houselights came back up and theater staff rushed to her aid. An ambulance was called and the stunned audience was asked to exit into the lobby for intermission. After about 10 minutes, personnel started setting up food service for what was supposed to be the post-show party. An announcement was made saying that Wallace was in "good spirits" and was being taken to the hospital. The second act was cancelled and the aidience invited to enjoy the food. Later the theater announced that today's matinee also would be cancelled. Updates on Wallace's condition and any additional schedule changes will be posted here at The CT Arts Connection as they become available. The Seven Angels Box Office is located at 1 Plank Rd., Waterbury. For information call 203-757-4676. A Raisin n the Sun has been a classic, telling of the American African experience at the dawn of the Civil Rights movement on Chicago's South Side, since it first debuted on Broadway in 1959 (the first play by an African-American woman to be produced on the Great White Way). 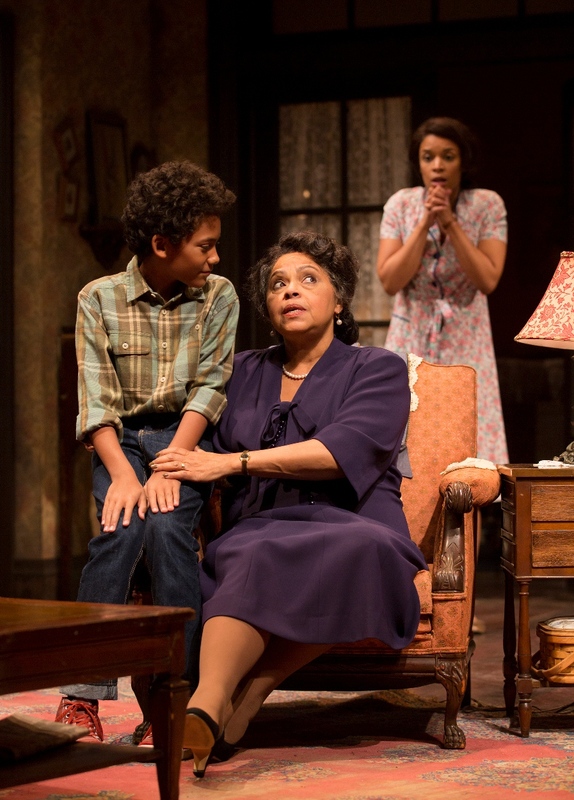 While some plays that broke ground in the mid 20th century have seemed sleepy and a mere rehash of old concerns when they have been revived recently, that's not the case for Westport County Playhouse's neat production directed by Phylicia Rashad. 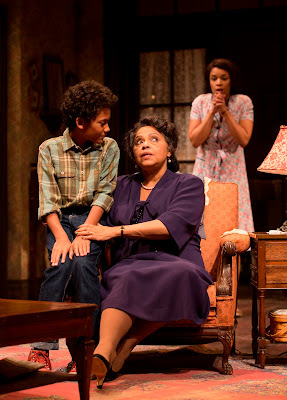 A focus on characters -- whose future legacy is the premise of the 2011 Pulitzer Prize winning play Clybourne Park -- makes this production of Lorraine Hansberry's work feel like a visit to old friends, or a smile-filled time of flipping the memories in a family photo album because we know how it all turned out. Rashad herself brings memories to the show: she won the 2004 Tony Award for best Actress for her portrayal of Ruth in the Broadway revival. Hansberry was inspired to write A Raisin in the Sun by her family's battle against racial segregation in Chicago. The Younger family is awaiting the arrival of an insurance check that could change their lives and get them out of the "rat trap" they rent. It's crowded. Sharing the apartment are matriarch Lena (Lynda Gravátt), daughter Beneatha (Edena Hines), son Walter Lee (Billy Eugene Jones) and his wife, Ruth (Susan Kelchi Watson), their son, Travis (Luka Kain) who has to make his bed on the living room couch. Each has a different idea of how the $10,000 left after the death of Lena's husband should be used, but most vocal is Walter Lee. He wants to leave behind his job of a "yes, sir," "no, sir," chauffeur it to invest in a liquor store with a couple of buddies. Lena, making plain to Walter Lee that she is the head of the family, decrees that part of the money wil be used to finance Beneatha's dream to be a doctor and another part will finance a dream she shares with Ruth: a home of their own. Walter Lee's drinking hasn't helped the growing estrangement between him and his wife and she has plans to abort the baby. Moving up might just keep the family together. The dream almost turns into a nightmare, however, when Lena puts a down payment on a house in the all-white neighborhood of Clybourne Park. Karl Linder (John Hemphill), president of the neighborhood's "welcoming committee," pays a visit and makes it clear that the Clybourne Park folks don't want any of "you people" bringing down the values of their homes. He offers to buy the Youngers out of their agreement -- a proposition that first angers the family, but later might be necessary when Walter Lee makes a huge mistake and invests some funds in a scheme with sidekick Bobo (Alvin Crawford). Meanwhile, Benny struggles to find an identity, the extremes of which are represented in the two men she dates: Joseph Asagai (Hubert Point-Du Jour), a fellow student from Nigeria who encourages her to embrace her roots and George Murchison (Gabriel Brown), a sort of nerdy guy who has assimilated himself into the white culture. The decisions they make and the effect give the play its name, taken from the poem “Harlem” by Langston Hughes, which includes the lines: “What happens to a dream deferred? 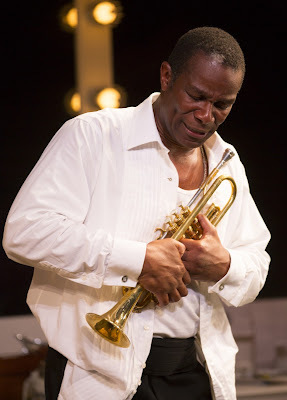 Does it dry up like a raisin in the sun?” Clybourne Park by Bruce Norris is a response to A Raisin in the Sun and reprises the Linder character. 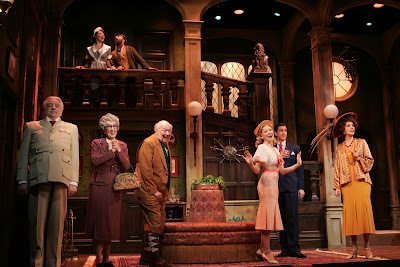 (You can see Clybourne Park here in Connecticut May 8- June 2 at Long Wharf Theatre in New Haven). Performances are good (David Blackwell associate directs), with actors clothed in period (and African) garb by costume designer Esosa on Edward Burbridge's detailed set that show a worse-for-wear apartment. Gravátt propels the show as the wise, faith-grounded matriarch who wants something better for her children and Watson delivers a layered Ruth full of warmth and depth. A Raisin in The Sun plays through Nov. 3 at the Playhouse, 25 Powers Court, Westport. Ticket and performance information: 203-227-4177; www.westportplayhouse.org. Westport Country Playhouse will present “A Day for Community,” on Sunday, Oct. 28, when all tickets will be $15 for the 3 pm matinee performance. Following the performance, there will be a “Post-Show Conversation: A Day for Community” centered on the theme of community as reflected in Hansberry’s play, featuring David J. Dent, professor of journalism at New York University, and Larri Mazon, chair of the Bridge Building Ministry at the Council of Churches of Greater Bridgeport. Additional guests to be announced. Before the performance, there will be a reception in the Playhouse lobby.